Hesti holds a master's degree in accounting and controlling from The Hague University in the Netherlands, and an undergraduate degree in commerce, majoring in accounting, from the Australian National University in Australia. Hesti's role involves the strategic management of operations of SMERU. She is responsbile for ensuring that SMERU's operational practices are in accordance with the relevant legislations, and coordinates staff within the division. Hesti was promoted to Deputy Director in 2012. Prior to this, she worked as accounting, finance, and administration roles for SMERU. 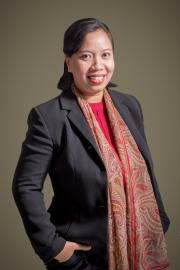 Before joining SMERU, Hesti worked in Canberra, Australia, as a financial officer.